Recently I have been learning the art of becoming a steward of my thoughts and words. Perhaps, to a degree, this is a learned behavior that comes with age, but realistically I’ve discovered the power of controlling your thoughts and actions is more of a habit that you have to actively pursue and develop. You don’t wake up one day with complete alignment in your thoughts, dreams, goals, daily tasks, priorities, and relationships. Rather, you have to consciously reflect on the ways that you have been sabotaging both yourself and others. On Silent Saturday, I challenge you to begin noticing, and if necessary, changing your words. The words that you speak inevitably impact the actions that you take and once that takes over your brain (holding your thoughts hostage), you have to work double time to conqueror something. The same is true in reverse. When you speak life with positive declarations and mantras and push through the dead zones, your words will change your thoughts and you will start believing that anything is possible. When you clear the obstructions of faulty thinking, your actions start to line up with your hope filled words. Before you know it, you’re accomplishing things you couldn’t have seen yourself doing under your old thought patterns. We have the power to create whatever world that we want to live in. Do I want to live in a world where I let doubt and fear dictate my future, or do I want to live in a world where nothing is impossible? Do I want to live in a world where things out of my control determine my emotional trajectory, or a world where I realize I choose my response even if the circumstance was out of my control? Anything I could ask or think or dream of, if my motivations are healthy, centered, and guided by mind, body, and spirit alignment, could become my reality. A simple clearing of my mental cache and my actions are released to take me where I need to go. I called this silent Saturday because perhaps there are some voices in our heads that need to shut up. It’s possible that we have heard these voices for so long that we no longer recognize them. At moments, the voices in my head have taken over my vocal chords and created a martyr or victim scenario, which take my power away leading to behaviors that drain and diminish the life force that I am. I can guarantee that there have been moments in your life where loose thoughts and emotions invade your world obstructing opportunity and maturity. Today is the day that we tell our thoughts and emotions who is boss. We will shut them up on this silent Saturday when they try to plant seeds that won’t result in the harvest we are looking for. We will replace them not only with more life-giving words and emotions, but with forward ACTION. I will control what I can control, which is my thought life, my speech, and my activity. Disclaimer: Sometimes we struggle with inflated self thoughts and that is just as toxic as being a downer. Grandiose thinking needs to be taking captive too. Sidebar: We had to practice some thought captivity this morning. 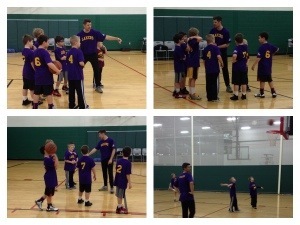 My sons basketball league lost in a BIG way. We had to pep them up. Previous PostDecisionsNext PostIt’s fun to go exploring!